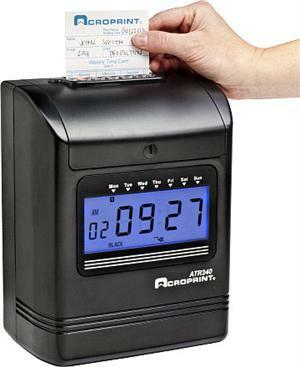 The ATR240 is a top-loading punch clock that uses familiar time cards for recordkeeping purposes. The clock features a large backlit digital time display, two-color printing and a built-in musical chime. This clock automatically adjusts for Daylight Saving time changes nad can optionally be equipped with a battery backup to allow punches even during a power failure.